The City’s National Pollutant Discharge Elimination System (NPDES) permit requires a facility plan when flows or waste loads entering the WWTP exceed 85% of design criteria. The existing wastewater treatment plant has exceeded 85% of permit loading limits on multiple occasions over the last two years. With the projected population growth and subsequent increase in influent flows the existing wastewater treatment process will require significant upgrades to meet anticipated water quality standards. 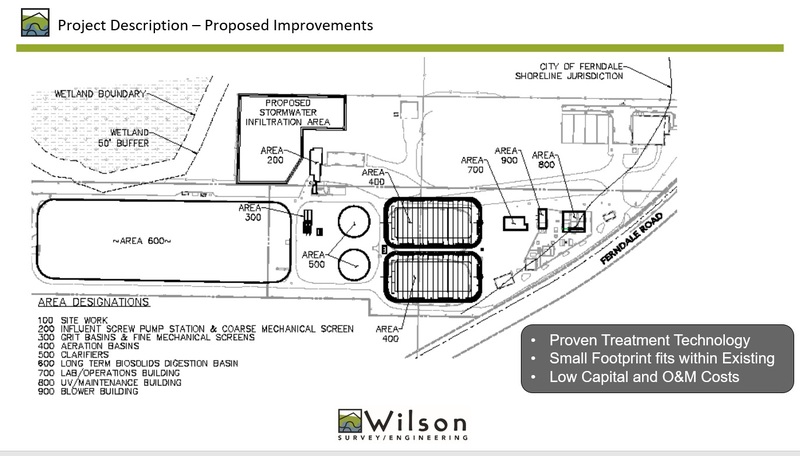 Six treatment processes and configurations were evaluated as potential solutions for the Ferndale WWTP. Extended Aeration was determined to be the best solution for the City of Ferndale based on its ability to treat the expected flows and loadings to the anticipated level of treatment necessary for discharge to the Nooksack River, as well as its low capital and operations costs and the layout of existing facilities.